What better way to introduce a new BOOK than with a new GIVEAWAY. We had a crazy spring, new projects for market, the new book and a huge deadline, and in the middle of it all, I stopped and make a holiday pillow. It was fun and fast and immediately made it's way to my living room couch. So it hit us, let's do a PILLOW BOOK. We got our delivery from the printer the day before market. The book was a big hit. 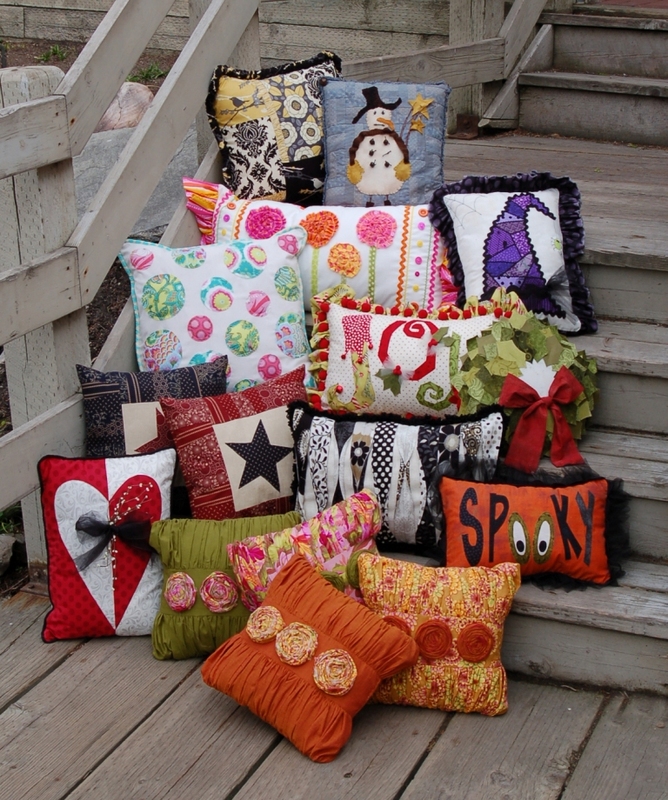 A TOUCH OF WHIMSEY has 12 different decorative pillows. 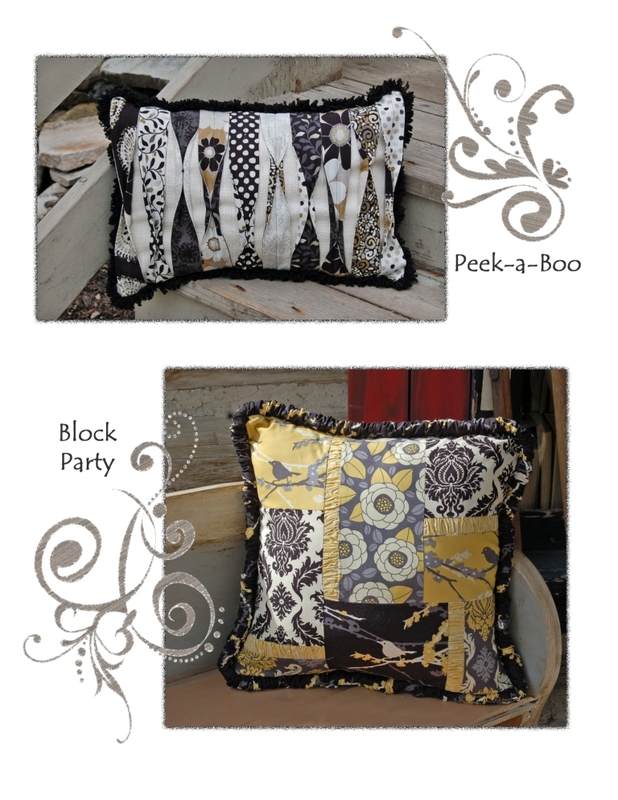 From holidays to decorator, the pillows are quick and easy, and a great way to use up your stash or your favorite new fabrics. They have fun textures and embillishments too. We have color pictures of all the pillows throughout the book. Here are a couple of samples. These are two of the pillows, all 12 are pictured on our website which brings us to our little contest. Three winners will each get a copy of the new book, A TOUCH OF WHIMSEY. THE RULES (if you can call window shopping on the internet a rule) Get up to five chances to win a book. 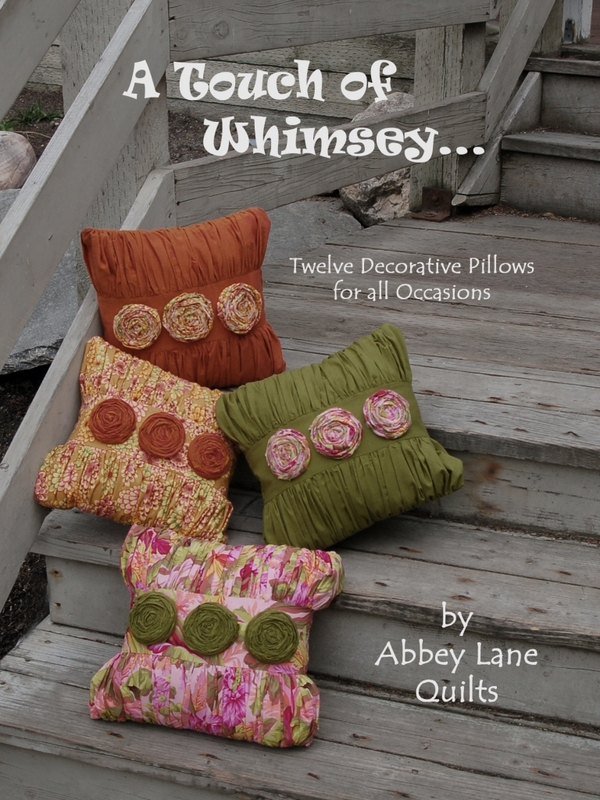 1 - Head over to the our website, http://www.abbeylanequilts.com/, go to the shopping page and click on the Touch of Whimsey book. It will take you to the page with all the pillows. Pick your favorite and leave us a comment telling us which one by name. 2 - Tell your friends about our little contest on your blog. We love going to your blogs to find out more about you. 3 - Become a follower of our blog. If you are already a follower, just let us know. 4 - Add us as a friend on FACEBOOK. Just look up Abbeylanequilts. 5 - Tell your friends on facebook about our little contest. That should do it. We will pick the winners next week after the holiday. Here is the back cover with a shot of all the pillows. I am following. 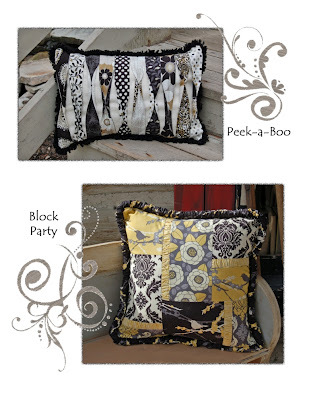 Super excited for the giveaway - the pillows show tremendous creativity and are beautiful. It's impossible to choose just one pillow - they are all so amazing. If I had to choose one I would choose "Frosty" because he is so darn cute. I love them all! But Lollipops has to be my favorite. I love bright colors and the flowers are so adorable. 1.I'm a new follower of your FABULOUS blog! 3. I am a Facebook follower of this blog! WOO HOO!!! Thanks for a great contest!!! I'm a follower! What adorable pillows! I'd have to choose (really just 1?) ...Lollipops. So happy! I've already like you on facebook! Thanks for the chance! You know I'm a follower on your blog and facebook. My favorite is Ruffles and Roses. I wish I would of gotten the chance to visit with you more at market. Congrats on the win. All your pillows are so cute and it's hard to pick just one, but I'm going with Christmas Joy. I'm a follower on FB. Thanks for the chance at the giveaway. Ruffles and Roses is my favorite. I'm already a Facebook follower. My favorite is Ruffles and Roses. We've been friends on FB! LOL! PEEK a BOO! lol, is my favorite. All of the pillows are such wonderful designs. Your blog is amazing and your artful work is AWESOME! No problem following you! I love your 'Spooky' pillow! The ruffle is my favorite! I am a follower! 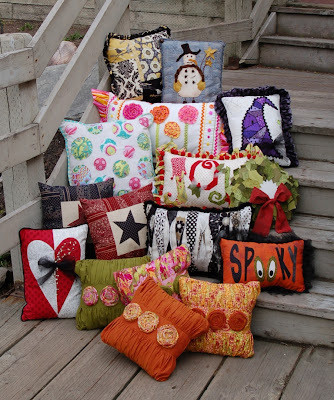 Love all of the pillows! It's hard to pick just one favorite. I especially love the Christmas Joy pillow. Thanks for a chance to win a copy of the book. Its hard to pick a favorite. Wellll..I love the Christmas Joy Pillow. All of them are stunning. I am now a blog follower. Thanks! I am a new follower and absolutely love them all. But I do have to say I am a huge Halloween fan. So I would have to say my favorite is "Bewitched"
I follow. I love that snowman. My favorite pillow is RUFFLES AND ROSES! I "like" Abbey Lane Quilts on Facebook. I like "bewitched" bc of the crazy pieced hat! I am following now! I like Peek-A-Boo for the pillow. It was hard to pick just one. These are just the cutest pillows ever!! Very creative! Do believe I need some new pillows... Thank you! I love the ruffles and roses pillow! Blogged about you on my blog. I love all your patterns. Way cute! I love Block Party! It looks like a designer pillow. The ruching looks great. Such a cute book. I like Evergreen the best, I think. Very cute pillows! My favorite is Confetti! It's very festive! I'm already a friend of Abbey Lane Quilts on Facebook. I am now a follower of your blog. Thanks for the great giveaway. I have to pick spooky for my kitty named spooky, but there are ssssoooooooo many sweet pillows it would be hard to choose otherwise. Bewitched is my favorite.... could it be I have a daughter with a Halloween birthday. I love the Lollipops pillow! It is so fun, full of whimsey, and cheery! I'm already a Facebook friend, that's how I found out about your great contest! Thanks!! So glad I found your blog--I'm now a follower!! So many great patterns--hard to choose! Love the variety of seasonal pillows,and I've always been a polka dot fan, so love Confetti! However, my 1st choice is Ruffles and Roses--I really like the texture and dimension of the pillow!! Thanks for chance to win your great book!! All of the pillows are SEW beautiful, but my favorite is Christmas Joy. And...the choices I made above about Chrysallis, Simply Summer, Wacky Block and turquois ric rac sound lovely and happy at the same time but there are SO many options.